If you're looking to buy a retro sweet hamper as a gift then you've come to the right place, whatever your sweet gifts budget. Because we have the finest range of sweet presents, unique gift baskets and gift ideas that you'll find anywhere online (and with incredibly quick UK & Worldwide delivery too by post or courier). We have different sizes of Retro Sweet Hamper gift baskets for you to choose from... ranging from medium (pretty big really)... to absolutely ginormous! And all of our unique hampers are absolutely jammed with nostalgia and the best sweets ever...! 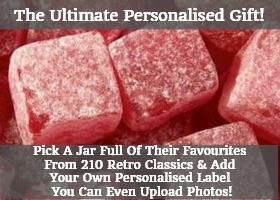 So if you're looking for PROPER retro sweet hampers with a difference, you've come to the right place! If you're looking for a cheap gift idea then take a look at our small tub and selection jar ranges - you get loads of traditional, vintage sweetshop sweeties at a surprisingly low cost. With our jar range you can choose from quality glass kilner jars all the way up to authentic, big, sweetshop style jars crammed with tuck shop favourites. Whether they love the jelly and chewy sweets made by companies like Haribo; or boiled sweets like Kola Kubes or Rhubarb and Custards; or if they are addicted to liquorice... whatever their favourite they're in for a real treat. For something bigger but still incredible value (we have medium and large options in many cases) - perfect for Christmas and birthday gifts for your friends and family for example - take a look at our retro sweet selection gift boxes. We have the perfect gift ideas for him or her and whatever their age (take a look at our decade gift box range from the 1950s, 1960s, 1970s and 1980s). Everyone will love being whisked back to their childhood sweetshop (where they used to fill up their mini, little white paper bag - or bags! - with their favourite pick and mix), whatever their age... Mum, Dad, brothers, sisters, Grandma, Grandad, uncles and aunts... after all, who doesn't have a sweet tooth? 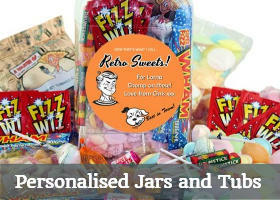 And with many of our old fashioned sweets selection tubs, jars and boxes you can personalise your gift with your own special message (you can even upload photos is you like!) to create the perfect personalised gift idea. They'll see your customised message and they'll be reminded of you every time they dip in for a sweet treat! And at the top of our chocolate and sweet gifts range are our giant retro sweet hampers - 3 sizes of proper, picnic-style wicker basket full of old-school, UK confectionery and chocolate delights. 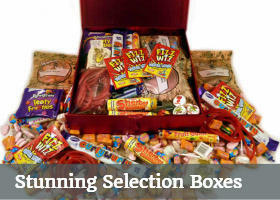 For British sweets online, from sweets from the 50's and 60's to the present day, you wont find a better selection or a faster, friendlier service.